There has been a few updates on the Malaysian Passport in recent years. 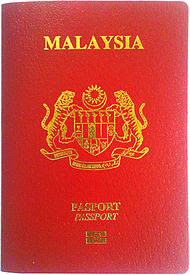 A few changes that has seen the older passport being phased out and replaced with a more secured and high-tech version. This entry serves as a guideline for all of you that are looking to renew your passport (that has less than 6-months of validity). Most important thing to obtain before you head over to the Immigration Department to renew your passport is to ensure you have the correct photo per requirement. Do take note that since April 2013, a new passport security measure has been implemented where the background of the photo is WHITE. You are required to wear a dark top (to frame the shoulder and chest). A decent photo shop should be aware of the requirement. 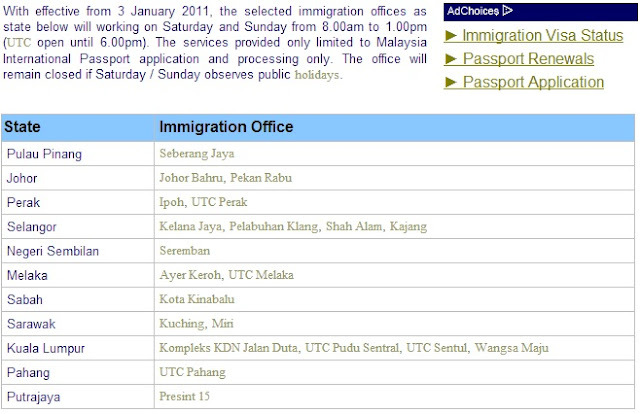 Next is checking the opening hour of the Immigration Department that you want to go. If you are busy on weekday and can only find time on weekend, you be surprised that the Immigration are open on both Saturday and Sunday. This has been in affect since 2011. If you do not know, you know now! Please take note that this entry is about PASSPORT RENEWAL and the weekend for these places are NOT for fresh applications and only for renewal purposes. The last I renewed my passport was in late 2008 when I was required to travel to Milan for work. It was the old passport where the photos and details were imprinted and laminated at the inside front cover. It is also non-ICAO (pronounced as I-ko) compliance (ICAO is International Civil Aviation Organisation) or non-biometric. Back in 2008, the process was a bit more shaky with limited numbers given out per day at the Immigration department due to ability to process these documents. Even though the Kiosk was available, the machine often see downtime due to over-usage. Online submission were not fully embraced as Malaysians are careful with submission of these sort (back in 2008). My work is requiring me to travel again and with my passport having less than 6-months of validity, I need to renew it. I headed to Immigration Department at Kementerian Dalam Negeri (KDN), Jalan Duta on Sunday. Intention was to arrive by 7.30am and line up for the number. As luck has it, I have to wake up late that morning. I left home at 8.20am and arrived at KDN by 8.45am. Went up and took my number at 8.52am. I was lucky number 1164 with 133 people waiting in front of me. I sat and see how fast the numbers were moving and noticed that one person was served approximately every minute. That worked out to be about 2-hours waiting time for me to submit my document. There were about 11 counters opened for renewal submission and with additional 5 allocated for senior citizen, pregnant women and handicapped. So, it was in full force. My respect for these men and women for working on a Saturday and Sunday. One can say they will get a day off, or get paid overtime handsomely; that is not the point as you can't buy back lost time with the (their) families that do not work or school on weekend! So, what do you do with so much time to kill? Renew my Identity Card. The Jabatan Pendaftaran Negara (JPN) is just downstairs! New Identity card done within the waiting hours! The typical waiting time is about 1minute per person. This is averaged out from the numbers of counter opened and processing time. Then at the handing over of the document, it takes about 2minutes for the officer to re-confirm and re-authorise your thumb prints before giving you the print out. You will need to hand over your IC at this point for verification purposes. Once that is done, come another waiting to pay for the renewal. RM300 buys you 50 pages (used to be 48) for 5 years. Kids under 12 and students (with student card) pay half the price for the same period. Waiting for payment takes you an additional 10-15minutes wait depending on how fast the payment can be processed at the counter. There are cases where the applicants came unprepared (insufficient cash) and hold up the rest pledging ignorance of the RM300 needed. With the payment done, you will get your IC back with a payment slip and your waiting number. Return in an hour to collect the passport. Should you only managed to make payment after 12pm (as the centre closes at 1pm), you may be asked to return the next day to collect the Passport. By the time I made the payment, it was 11.30am. It took me total of 2hours 30mins from arriving to payment. With 133 person in front of me, the 1-min/person rule seems about right. I went back to KDN at about 12.45pm after having a fantastic lunch at Coffee 5 Cups. It is just down the road and no better way to actually sit down and enjoy a cup of Peaberry coffee and some food. 5 years back, the passport was only 32 pages, now 50 is standard. No more choices of 64 pages for heavy traveller. Serial number on horizontal plane (new) vs vertical on old. The Polycarbonate sheet. Laminated plastic. If this page is torn (high potential), you lose your identity. I left KDN at 1pm sharp. I went to KDN to renew my passport and got more than just that done. I went back with a new IC too. Go early to line up so you can get the documents done. The later you go, the longer you have to wait. Do not blame the officers for "slow service" when you were the one arriving late. Be fair to them - total processing time and payment time is actually less than 20minutes. That is with 133 person in front of me. Try not to bring food into the immigration department. Sadly, the place was littered. Some Malaysians lack civic-consciousness. Do dress appropriately. Have respect for others that do not share your fashion sense (or lack of). I went home and was surprised by Wifey presenting me with a new passport holder. :) She said since I've started a new job and expected to travel a fair bit - looking good doing it doesn't harm ;-) Thank you wifey! thank you for the info! So, I don't need any application form or photocopy of the documents for the renewal passport right? Hi there. Thank you for your very helpful info! May I ask some questions here? 1. Passport renewal just need 3 items as stated above (old passport, IC, and photo)? Don't need to fill up any forms? 2. Some news (and forumers) saying that currently IMI is doing some upgrade to their system, therefore it takes around 3 days time to able to get the passport done. Is that true? 3. Passport expiry date is 2/3/2014. If my travel date to Taiwan is 24/8/2013, is it still valid? Your helps on these questions are highly appreciated, and wish to hear from you soon. 1. Yes. Make sure Photo is white background. 2. The news and forummer not entirely sure where they get their news. Not true. Same day you will get provided you go early enough. Else, the next day. 3. validity is 6 months. so August 24 to March 2 is tchnically not valid. Short of 22 days. Jimmy - do you know my maths for SPM is C3? Yes, you are right. Christopher - you are valid by a month! Hi, do i need to take the photos in advance before i go? i heard it is compulsory to take the instant photos at the photo booths that they setup for passport application/renew. is this true? what is your advise on the better way on this? You can take your own photos. Just go to the photoshop and make sure they know the ruling of white background. There is no such thing as compulsory to take at the photobooth. I believe what happened before was ppl coming with wrong background/specs photos. Hi...my passport is the old type with blue picture and it has not expire, so do i need to make another new polycarbonate passport or use my old passport until it expires then renew it? Thank you very much for your information :) I've checked so many sites, as well as the Government sites, and I'm a bit confused. There is a Borang Permohonan Pasport which I thought had to be filled in? Is that now not required for renewal? Thank you, really appreciate :) All the best, much joy to you and your family! If my ic chip is undetectable, can I still proceed to renew my passport? How long does it take to change new ic ? IC change is an hour. If my thumbprints are damaged, will they still accept them? You might have to go get a new thumbprint drawn on your thumb if it is damaged. Or you meant the thumbprint on your...errm...IC? The best and detailed info i've ever read. Thanks alot man. good luck with the renewal! Hi, first of all, thanks for this useful info. What time the office open for weekend? Every sat and sun open? Where to get number to renew passport and IC? Sat and Sun from 8am to 1pm. if you go at 12pm, you may or may not get to renew it. And if you do, you may have to come back the next day to collect. The number is at the counter. You have to show you have the correct photo before they give you the number. Office open at 8am, so I can only Q at 8am? What's the pricing for renewal passport and IC? How many photos should I bring for both passport and IC ? 1. Can que start at 7am. 3. Passport you need two. IC no need, take there FOC :D Remember to smile! Hi, need to present birthcert for renewal ? What time they start giving the number ? Hi, may I ask if they open during weekends? The machine may not be open on weekend. When I was there, it wasn't. Suggest if time is tight, best to go day 1 and make sure you get all things done. Old BLUE IC aka the one without chip? I believe you have to renew it. JPN is just a floor down from passport and you can get the new IC done in an hour. Hi.. Is the photo has to be in black n white originally or only with the white background if I wish to prepare it myself? It has to be white background. do they return you your old passport after issuing the new one? hi, just curious I just got mine renewed at UTC Sentul. Is your pasport on page 47 blank or have pasport holder info ? Page 49 you meant. It will note down the last passport you have. If you do not have, then it will be empty. "The Polycarbonate sheet. Laminated plastic. If this page is torn (high potential), you lose your identity." You still have the build in chip inside the back cover. How about renewal at Malaysian embassies overseas ? Seems like the forms are stil required !! 19th March 2014, the Immigration Passport office does not accept our photographs take from shops outside. The passport office will take your photo at a digital camera counter. Most useful. Many thanks for the update. I will use the info to update the post.